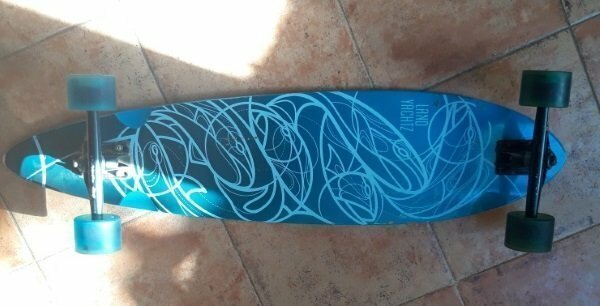 I’ve been riding my Landyachtz Chief longboard for months and I’m more and more in love with it, so I thought I’d write a post about it to share my experience. Why choose the Landyachtz Chief? 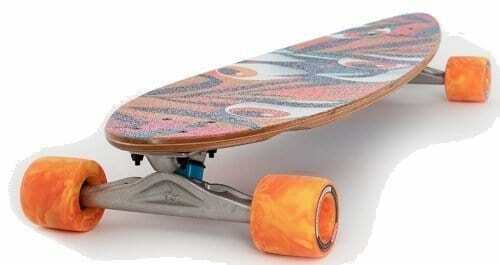 It’s an amazing small pintail longboard designed for cruising and carving in the city and on the boardwalk. It is highly responsive and fast-turning, with a high-quality flexy deck – particularly the bamboo version. The slight rocker and concave make it very snappy and comfortable. The Grizzly trucks are great for carving and pumping, and the Fatty Hawg wheels are super smooth rolling even rougher roads. Traditionally, pintails work best for leisurely cruising around and hanging out. I found my Landyachtz, however, is capable of handling more technical riding styles. What is the Landyachtz Chief good for? The Chief is designed for carving and cruising in relatively crowded spaces. I like to use mine on the boardwalk along the beach, which does tend to get busy on weekends. The Chief is a compact and agile, being a relatively small pintail with a short wheelbase compared to classic pintails. Besides wheelbase, the Chief’s topmount construction makes it super responsive with very quick and precise turns. On the flip side, the Chief rides relatively high above the ground (again it’s topmount) but that’s somewhat offset by its rocker and flex, making pushing easier and giving you the best of both worlds – responsiveness and manageable height. Again, the first thing that strikes you when riding this quality board is the maneuverability and the instant turns. I personally love it. As mentioned earlier, the Chief is a classic pintail, i.e. shaped like a tear drop with a pointy tail and a wider nose. You can also say it has the shape of a longboard surfboard, only much smaller. The chief is 36″ long and 8.75″ wide, with a tight 26.5″ wheelbase. Landyachtz has based the Chief’s pintail design off of the Pinner and Totem, two of its predecessors, but with the added goal of creating a smaller, more nimble carving cruiser for city cruising. As a result, the Chief is the most responsive and lightweight pintail of Landyachtz’s lineup. It’s a very reactive and turny board, to a degree one may not expect from a pintail. For this reason, the Chief may not be the best option for a complete beginner looking for a very forgiving first board. The Chief even has a very slight kicktail (with a very low angle), which confirms the board’s focus on carving and quick turns. The mellow radial concave with slightly upraised edges provide grip and a nice leverage on the rails for carving . You feel it under the ball and heel of your feet but in a mellow way. In short, the Chief gives you the freedom of a flat pintail deck with the added comfort and secure feel of a shallow concave. The subtle rocker and the flex contribute to that feeling (keep reading for more about flex). The Landyachtz Chief comes in 2 versions (and 4 graphic designs): a bamboo version and a maple version. I personally own the bamboo but I’ve had the chance to test the maple version. The bamboo versions include the Bamboo Chief Fish (my board), the Bamboo Chief Eyes (Amazon), and the Bamboo Chief Camping. I for one am a really big fan of the looks of my Bamboo Chief Fish with its turquoise bottom background and edges, the while lines graphic on the bottom, and the turquoise fish drawing that sticks out on the top showing through the clear spray-on grip! UPDATE: unfortunately it seems the Chief Fish version is no longer available! As always with this material, the bamboo core makes the deck super lightweight, strong, and flexy! The flex properties contribute to making the Bamboo Chief an amazing carving board for a pintail. So if you position both your feet close to each other toward the center of the deck where it has the most flex (i.e. away from the truck mounts) you can use the flex to get great rebound and pump tons of energy into your carves. This combined with the great carving Grizzly trucks really makes this pintail and astonishing carving board (read on for more on trucks). The hardwood Canadian maple used in the maple Chief is very strong and durable. Only 7 plies are used to achieve a relatively lightweight and flexy result given the naturally rigid nature of maple wood – though obviously not as light and flexy as bamboo. Thus, the version of the Landyachtz Chief you’ll choose will depend on your preferences in terms of flex amount and graphic design. The bamboo models are about $10 more expensive than the maple one, running around $220 (Landyachtz list prices). 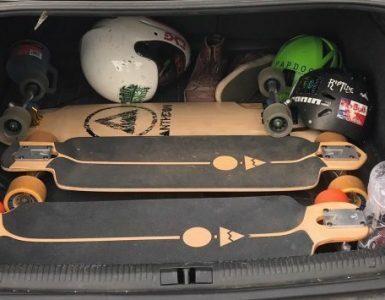 Again, I just love riding that surfboard-like, super comfortable rockered and concaved deck when going for a cruise around the neighborhood or carving along the seaside. The shape and flex of the deck is not the only reason the Chief is so comfortable and responsive, though. The Bear Grizzly GR852 180mm 52º trucks play an essential role in that responsiveness. These trucks are not only extremely stable and “kook-friendly”, they’re extremely nimble and turny. A slight pressure on one of the (slightly uplifted) edges is enough to make the trucks turn, yet the amount of turn isn’t excessive unless you dig harder into the rail. That is, these trucks give me exactly the amount and tightness of turn I want each and every time. I make easy 180º turns on a normal sidewalk – which is not the case with every 36″ cruiser out there, e.g. drop-throughs and classic pintails. When I say this board is responsive and tight turning, I really mean it. By default, the Chief comes with 1/8″ soft risers. This, combined with the deep CNC/sanded wheel wells on the bottom of the deck above the wheels, pretty much eliminates all wheelbite even when making those super tight turns – even though I’m running my trucks very loose. I didn’t expect this when I ordered the Landyachtz Chief as I was just looking for a normal pintail to cruise around on. Turns out I got myself a real carver I can actually pump on and even do some small slides (not what a pintail is meant for). The Hawgs wheels that come with the Landyachtz Chief are another high-quality component of the overall pintail package. The Chief ships with either Fatty Hawgs 63mm or Hawgs Mini Monster 70mm wheels, both great and smooth rolling wheels. Both with a 78A duro, they absorb small cracks and bumps very comfortably. These wheels have a fairly wide 50/55mm contact patch and are offset aligned, making then fast-rolling and grippy for smooth carves. They are capable wheels on different types of terrain, rough or smooth. They’re also pretty good wheels for sliding – although that’s somewhat beyond the Landyachtz Chief’s scope. Both wheel options come with Bear Spaceball Bearings which keep the Chief’s wheels rolling forever – even more so once your break them in! The Chief almost feels like a different, better board after you ride it for a while, such a super smooth glider. You probably get the idea, the Landyachtz Chief is one of my favorite longboards and my go-to machine for cruising and carving around comfortably along the beach. It’s super comfortable due to its relaxed concave and mellow rocker, and extremely nimble and steerable. Paired with its big soft Hawgs wheels, it can roll endlessly over all sorts of terrain. The Grizzly trucks and the awesome bamboo flex also make it a carving champion and a surprisingly good pumper for a pintail. Plus, I just love the design and colors of my Bamboo Fish.